to suppress, remove or otherwise inhibit the display or use of religious symbols in public locations, including public schools, the court shall not permit a party to participate by pseudonym and shall not seal the records in the case absent a showing, by clear and convincing evidence, that a party would otherwise suffer serious physical harm. Rep. Krieger is specifically upset about the lawsuits brought by the Freedom From Religion Foundation on behalf of local families asking to remove the 10 Commandments from display in front of public schools. Keep in mind the courts have consistently argued that the displays are not valid. Since the schools can’t win on merit, Rep. Krieger wants to make it harder to sue. You can listen to his rationale on a WTAE broadcast (complete with a very cheesy opening sequence). “Religious expression in public places has been part of our nation and Pennsylvania for generations, from the founding of the Commonwealth by William Penn and onward to modern times,” Krieger said in a news release Wednesday. “Passage of House Bill 922 would guarantee that no individual or organization will be able to use our state courts as a weapon to attack the right of Pennsylvania citizens to display religious symbols in public places while hiding in the shadows,” Krieger said. That is to say, there is no “right of Pennsylvania citizens to display religious symbols in public places”. 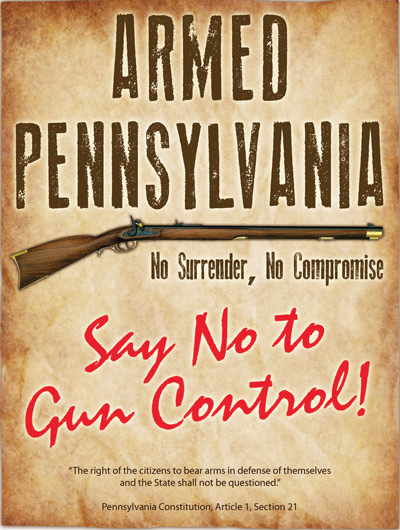 I suppose it should not be surprising since he also wants an “Armed Pennsylvania” that will not surrender or comprise. Comprise? When did that become a bad word for a politician who is to represent ALL his constituents? In fact, we have strong evidence that plaintiffs are abused when identified. There is well-documented evidence of serious threats against Jessica Alhquist in a similar suit in Rhode Island. In the two local cases (Valley High and Connellsville Junior High), the plaintiffs filed as ‘Does’ to protect their anonymity. When the school districts objected, the judge looked at the evidence and agreed that they have the right to remain anonymous. That is, there is a process within the established law to allow or disallow John and Jane Does. Right now, the HR 922 is before Judiciary Committee. You can contact the committee chairs or any committee members through its website. It time to stop this kind of hate legislation now. HR 922 begins by referencing the first amendment of the U.S. Constitution (fine and dandy); but then also points to Section 3 of Pennsylvania’s as well; but if I read section 3 correctly, “…and no preference shall ever be given by law to any religious establishments or modes of worship”. If this thing doesn’t get bounced simply based on that, then there is something very very wrong with the judicial arm of our state government. Did Kreiger et. al. even read that section?